Rowland 82, Corona 25 — Faith Castillo had 16 points, eight rebounds, five assists and four steals and Tianna Eaton had 16 points and 10 rebounds for the Raiders (3-0) in the second round of pool play game at the Bonita tournament. Also contributing to Rowland’s win were Rachel Capinia, who had 13 points and eight rebounds and Kaylin Ngo, who had 11 points. Wilson 72, Ayala 66 — Ethan Sims had 36 points and eight rebounds for the Wildcats in a Bosco Tech tournament game. Jeffrey Von had 14 points and seven assists, William Tai had 12 points, six rebounds and three assists and Winston Kong had 10 points. Rancho Cucamonga 68, Rowland 62 — Curtis Hong had 24 points, Phil Aguiniga 21 points and 10 rebounds and Jarbas Faria seven points for the Raiders (2-1) in a San Dimas tournament loss. Damien 3, Diamond Ranch 2 — Lucas Lizardo, Sean McNichols and Daniel Aviles each scored a goal to lead the Spartans. Charter Oak 5, Edgewood 0 — Vanessa Reynoso and Amanda Hill both scored twice and Andrea Jaimes scored a goal for the Chargers (2-0) in a nonleague game. Diana Borbon had an assist for Charter Oak. Rowland 72, Bell Gardens 48 — Curtis Hong had 27 points and four assists and Phillip Aguiniga had 21 points, 11 assists, seven steals and six rebounds for the Raiders (2-0) in a San Dimas Tournament victory. Monrovia 73, Jefferson 33 — Adam Woods Jr. had 18 points for the Wildcats (2-0) in a Sierra Vista/Covina Tournament victory. Perris 56, Wilson 54 — Jeffrey Von had 13 points, three rebounds and two assists and Ethan Sims had 11 points and 11 rebounds for the Wildcats in a nonleague loss. San Dimas 48, Alta Loma 43 — Donnell Leffridge had 16 points and 10 rebounds and Ronny Rafeh added 14 points and had 13 rebounds for the Saints in a Gary Prestesater Classic win Monday. Monrovia 68, La Puente 47 — Adam Woods had 17 points and nine rebounds and Rory Hare had 16 points, six assists and four steals for the Wildcats in a Sierra Vista Tournament win Monday. Charlie Scott had nine points and six rebounds for Monrovia. Ralphie Macias had 19 points for La Puente. Rowland 68, West Covina 43 — Rachel Capinia had 15 points and Tianna Eaton and Faith Castillo both had 14 points for the Raiders (2-0) in a Bonita Tournament victory. Eaton also had eight assists and seven steals and Castillo also had nine rebounds. Kaylin Ngo had 12 points and six assists and Nicole Woo had eight points and five rebounds for Rowland. Glendora 48, Canyon 42 — Sarah Zweerink had 12 points and McKayla Tilton added 11 points for the Tartans (2-0) in a La Habra Tournament victory. La Habra will play against Whittier Christian on Thursday. Rowland 3, Walnut 1 — Melissa Rodriguez scored twice and Melanie Romero scored a goal for the Raiders (1-0) in a nonleague game. Tyesha Valles had two assists for Rowland. South Hills 3, St. Lucy’s 1 — Madison Warren scored twice and Madison Fortich scored a goal for the Huskies in a nonleague victory. Los Osos 3, Glendora 1 — MacKinley Gregus scored a goal with an assist from Carissa Pierce for the Tartans in a nonleague loss Monday. Charter Oak 12, San Dimas 4 — Katie Fugit had eight goals and 11 steals and goalie Samantha Wilson had eight saves for the Chargers in a nonleague win. Sabrina Shaw scored twice and had an assist for Charter Oak. Francesca Vargas scored twice and goalie Seraiah Riley had five saves for San Dimas. 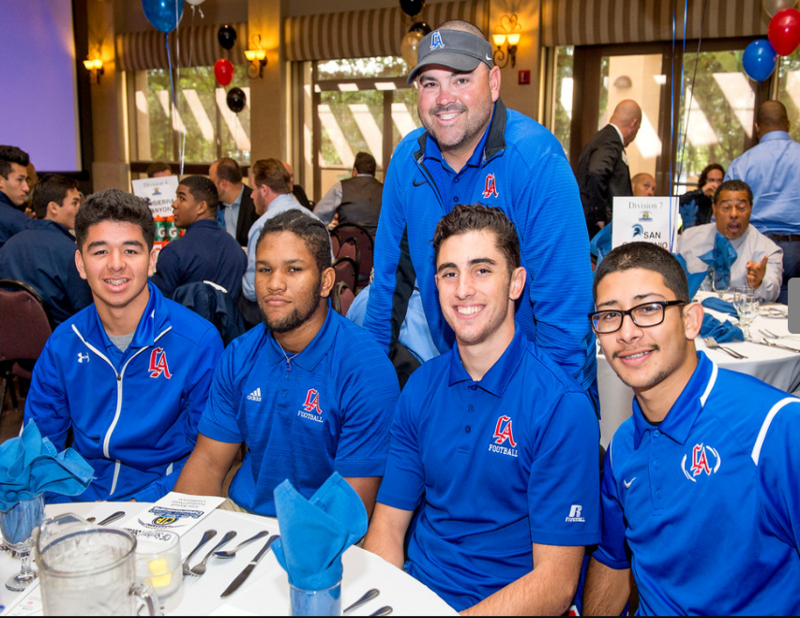 Division 6: Paraclete (9-4) at Los Altos (13-0), Friday, 7 p.m.
Division 12: Rancho Mirage (11-2) at Arroyo (12-1), Saturday, 7 p.m.
CIF LUNCHEON: The experiences couldn’t have been more drastically different for the representatives of the Arroyo and Los Alto high school football teams at Monday’s CIF Southern Section Press Conference and Luncheon. It hasn’t sunk in,” Singiser said. “I want to go over and talk to (Mater Dei head coach) Bruce Rollinson. I got my picture taken with Chris Rix. I’m just like a kid. It’s awesome. It’s a real big honor for us and these kids to be able to experience this. I periscoped the final mintue with Los Altos trailing 28-24. Watch the dramatic finish with Khayman King hauling in the game-winning 19 yard TD pass from Kody Olmos with no time left for a 30-28 Los Altos win. 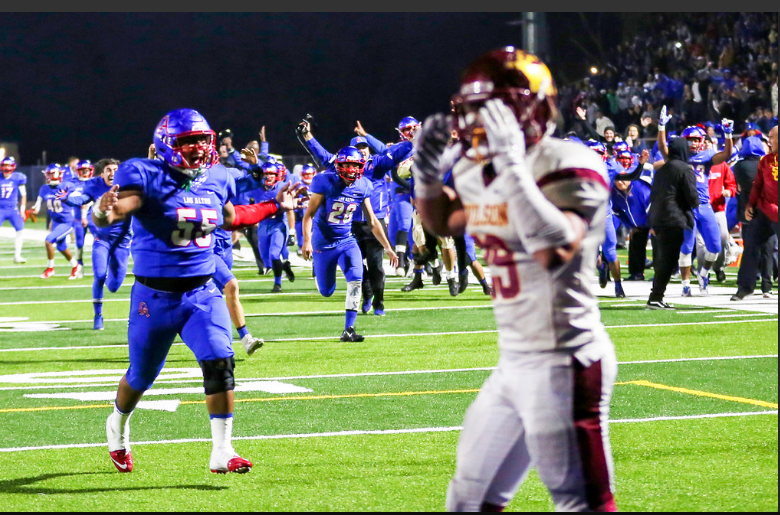 Los Altos wins on final play of the game: Los Altos and Long Beach Wilson went toe-to-toe and back-and-forth for every second of their CIF Southern Section Division 6 semifinal game Friday night, with the right to play for the championship next week at stake. In the end, it was Los Altos that made one more big play. And what a play it was.Khayman King pulled in an 18-yard touchdown pass from Kody Olmos as time expired for a dramatic 30-28 Conqerors’ win, saving their undefeated season and putting them in the division final for the second time in three seasons. Arroyo rolls into Division 12 finals: It didn’t take long for Arroyo High’s offense to get it going in the CIF-SS Division 12 semifinal game on Friday night. Once it did, the Knights did not let up.Arroyo sophomore quarterback Ernesto Camacho threw six TDs and 421 yard en route to a 70-21 blowout home victory over visiting Segerstorm. 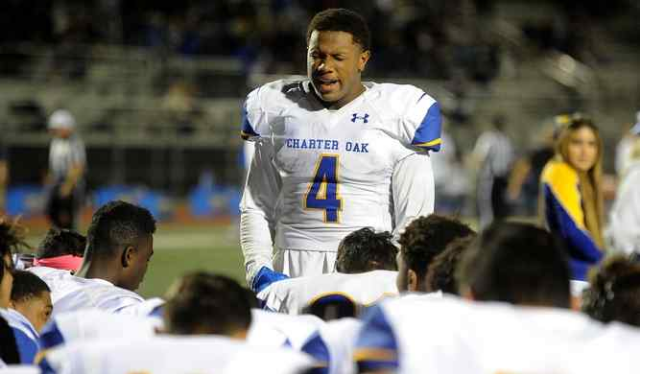 Charter Oak can’t keep up in fourth: In the end, the Charter Oak High School football team had nothing left to give. Besieged all season by injuries to key players, the patchwork Chargers gave undefeated Sierra Canyon all it could handle for 3 1/2 quarters. But ultimately, the Chargers gave out in a 42-19 loss in the semifinals of the CIF Southern Section Division 4 playoffs. South El Monte’ D-13 bid comes up short: Big plays early in the game and big plays later in the game helped Rancho Christian High earn its way to the CIF-SS Division 13 championship game next week with a 42-28 win over South El Monte on Friday night. Four of Rancho Christian’s six touchdowns were on plays of 30 yards or more. The other two touchdowns were aided by plays of 30 or more yards on each of the two drives. Edison at La Mirada, Friday, 7:30 p.m.
Paraclete at Los Altos, Friday, 7:30 p.m.
Rancho Mirage at Arroyo, Saturday, 7:30 p.m. It's looking like the San Gabriel Valley Tribune football player of the year is a three-horse race. Who you like with semis/finals left? Also, read this morning’s story on the Man of Casteel: Legendary Charter Oak High School football coach Lou Farrar wasn’t mincing words following last Friday’s win over Downey when he said that Chargers all-purpose standout Brian Casteel may be the best athlete he’s ever coached. For Farrar, a 48-year veteran head coach, to make such a lofty statement after having coached talents like Jason David, Steve Stevenson, Adam Muema, Chris Allen, Will Harris and many more, was really say something. 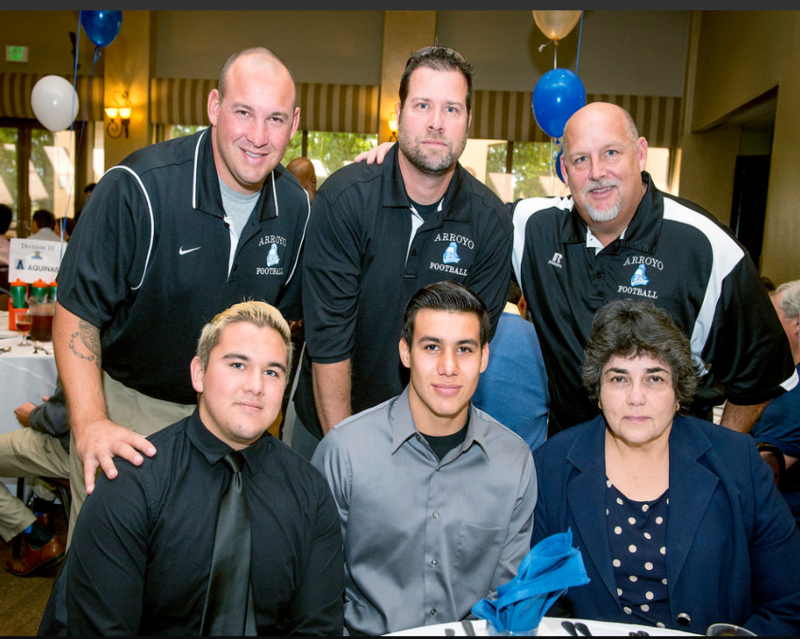 And the praise wasn’t lost on Casteel, who is as much a Charter Oak football historian as he is a player. There will be no blaming Aram and I this week, so save your posters. With the exception of me taking Murrieta Valley over La Habra, Aram and I are picking the rest of the area teams to win. It’s not homerism really, they are all close games on paper but there are more reasons to feel good about your local teams chances, than feel the opposite. If we’re right, or half right, we could have seven, possibly eight teams in CIF finals next week. You know that probably won’t happen, so to make this interesting, I’m going to list in order most likely teams to win down to the least likely team to win. Rowland 66, Nogales 19 — Senior Tianna Eaton had 17 points, five rebounds, five steals, three blocks and two assists and freshman Kaylin Ngo added 12 points for the Raiders (1-0) in a nonleague contest. Juniors Nicole Woo and Rachel Capinia had nine points for Rowland. Rowland 69, Nogales 25 — Jarbas Faria had 20 points, Phillip Aguiniga added 14 points and Curtis Hong had nine points and five assists for the Raiders in their season opener. Aguiniga also had eight rebounds, seven assists and six steals. Edgewood 74, Western Christian 27 — Daniel Felix had 18 points, Ozzy Mancilla added 16 points and Nico Yamamoto had 10 points to lead the Lions (1-0) to the nonleague victory. El Monte 88, Aveson Global 47 — Jordan Ayala had 25 points and Devin Romero added 15 points for the Lions in a Turkey Tournament victory Monday. West Covina 9, Western Christian 0 — Matthew Heredia, Jose Arellano, Julian Reyes, Alfredo Luna and Oscar Velez each scored a goal for the Bulldogs (1-0) in a nonleague victory.